Former Tennessee Supreme Court Chief Justice Frank F. Drowota III, whose decades-long career as a judge earned him the admiration and respect of innumerable Tennesseans both inside and outside the legal system, passed away Sunday, April 15, 2018, at the age of 79. Justice Drowota’s 25 years on the Tennessee Supreme Court, from 1980 to 2005, make him the second longest-serving justice in state history. During that period, he was elected chief justice twice by his peers. He also previously served on the Chancery Court of Davidson County and the Tennessee Court of Appeals. At the time of his retirement, he was the longest-serving active state court judge. Justice Drowota’s death brought an outpouring of remembrances from other prominent legal figures in Tennessee. Justice Cornelia Clark worked under Justice Drowota both when she served as trial judge and when she was director of the Administrative Office of the Courts. Justice Drowota was born in Williamsburg, Kentucky, the son of a minister. He was 5 years old when his family relocated to Nashville and his father became the head of the fledgling Woodmont Christian Church. Justice Drowota and his family actually lived in the church building for several years before moving to a parsonage. His parents hoped their son would make the parsonage a more permanent residence, but Justice Drowota felt drawn to another field. Justice Drowota attended Montgomery Bell Academy, where he excelled academically and on the football field. He graduated in 1956, having been voted “Most Friendly,” by his classmates. His football career continued at Vanderbilt University, until he was sidelined by a knee injury. After earning a bachelor’s degree in history and political science, Justice Drowota, a member of the Naval Reserve Officer Training Corps (NROTC), joined the United States Navy as an ensign. Justice Drowota called his subsequent time aboard the aircraft carrier USS Shangri-La “two of the best years of my life.” Onboard the ship, the minister’s son not only had his first beer, he also got his first legal experience, of a sort, representing some of his crewmates in disciplinary proceedings after those crewmates got into trouble on shore leave. Justice Drowota went back to Vanderbilt for law school. During this period he met his wife of more than 50 years, Claire, at a church camp where they were both counselors. After law school, Justice Drowota joined the firm of Goodpasture, Carpenter, Woods & Sasser in Nashville, where he began as the self-described “low man on the totem pole.” That humble position led to him becoming deeply involved in Chancery Court proceedings. “I became the Chancery Court lawyer because none of the others wanted to do it,” he said wryly in 2006. When a Chancery Court of Davidson County vacancy opened up several years later, Justice Drowota decided to take a pay cut and go for it. In 1970, he got the appointment from Governor Buford Ellington. Justice Drowota was just 31 years old at the time. Justice Drowota said that at first he expected to stay on the court just a short time, but he quickly fell in love with the demanding, but rewarding work. He heard cases twice a day, and often spent Saturdays and Sundays at court with his fellow Davidson County chancellor, Ben Cantrell, trying to keep caught up. Justice Drowota’s next move came in 1974, when Governor Winfield Dunn appointed the 35-year-old Drowota to the state Court of Appeals. Drowota stayed there until his election to the Tennessee Supreme Court in 1980. 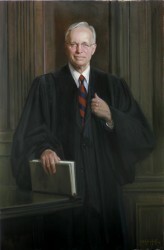 He served as chief justice from January 1989 to September 1990 and again from August 2002 until he retired in 2005. Around the time of his retirement, Drowota remembered his tenure on the state’s highest court fondly. During his tenure as an appellate judge, Justice Drowota participated in more than 4,500 decisions and authored at least 1,000 majority opinions and more than 100 dissenting and concurring opinions. As Drowota explained in the 2006 interview, it was his passion for his work and the legal community that kept him on the bench for so long. His impact, though, did not end when Justice Drowota left the bench. Apart from his judicial work, Justice Drowota was an active member of the Nashville community throughout his life and saw public service as a key ingredient to being a successful judge. “It gives you a better feeling and a better knowledge of the community in which you live,” he said. In addition to being an elder at Woodmont Christian Church, Justice Drowota served on the boards of directors for the YMCA of Nashville and Middle Tennessee, the Nashville School of Law, the Cumberland Museum & Science Center, the National Conference of Christians and Jews, Children’s House, Opportunity House, the Bill Wilkerson Speech and Hearing Center, and the Disciples Divinity House. He also served as president of the Nashville Rotary Club and the Nashville area chapter of the American Red Cross. He was a trustee of Montgomery Bell Academy, the Dantzler Bond Ansley Fund, and The Frist Foundation. Justice Drowota is survived by his wife, Claire, and their two children, Helen Drowota Close of Nashville and Dr. Frank R. Drowota of Murfreesboro. Services will be held Saturday, April 21, 2018 at 3 p.m. at Woodmont Christian, with visitation starting at 12:30 p.m. at the church. The church is located at 3601 Hillsboro Pike, Nashville. To submit a remembrance or condolence, please click here. "As brand new attorneys, Bill and I were so fortunate to get to know Chief Justice Drowota and Claire professionally and personally. His respected intellect and energetic leadership brought honor to our profession and the entire Judiciary. However, his quick wit, warm personality and generosity to others inspires us all to be the best people we can be." "Simply put, he was the finest man I have ever known. There has never been a better role model for young lawyers. He did his teaching with deeds, not words. He never said an unkind word about anyone, always treated everyone with respect, and was possessed of great wit and good humor. Despite many opportunities to enter the private sector, he devoted his life to serving the people of Tennessee. Almost every day when we worked together, he ended the day going to a meeting to provide leadership to the bar, his church, the YMCA, or one of his many public service activities. He was the best of friends, never failing to call on my birthday, our anniversary, or even when Tennessee beat Vanderbilt! He was a courageous supporter of legal reforms like comparative fault, merit selection for judges, and access to justice rules and initiatives. His marriage to his beloved Claire and his devotion to his family also set an example for all who knew him. My heart is broken today but the balm for this pain is that I witnessed a life magnificently lived." "Justice Drowota served on the Court during the time that I worked as a staff attorney for the Court. While, of course, he was an excellent jurist, I most appreciated his warmth, friendliness, and generosity to those of us who served the Court. He reminded us that we are professionals with an important role to play in the administration of justice. I am grateful to have known him." "When I came to my first judicial conference as a brand new judge 24 years ago, Justice Drowota asked me to have lunch with him that first day. Although I was in total awe of him, having never before met an appellate judge, he quickly did his best to put me at ease. He was that kind of person. In the years since then, I consider myself very blessed to have worked not only with him but also with his sweet wife Claire, both consummate public servants. If there are any disputes in heaven, I know the Lord has already put him in charge of resolving them in as friendly a manner possible." "Good works are conspicuous, and even those that are not cannot remain hidden." I Timothy 5:25. "We were blessed to share life and a profession with this extraordinary man. As the son of a minister, he often reflected that unlike his father, he did not get the "call" to the ministry. Actually, I believe he did. He was called to a ministry of justice, and he accepted the call." "I remember Justice Drowota’s smile and wonderful sense of humor. He seemed to always be in a good mood and wanted others to share in that. I also remember him as being a very real and approachable person, not standoffish or aloof at all. He spoke warmly to everyone, regardless of their position. One of my fondest memories is him “roasting” Tim Townsend at Tim’s retirement. Tim had played many pranks on Justice Drowota and Justice Drowota did an excellent job of evening the score that day. He leaves an incredible legacy and will most definitely be missed!" - Ann Lynn Walker, Technology Director, Administrative Office of the Courts. "I had the honor of serving as Justice Drowota's law clerk from 1996 until his retirement in 2005. He was an outstanding judge and dedicated much thought, effort, attention, and energy to fashioning opinions that balanced legal theory with the realities of the practice of law. He revered the Tennessee judicial system and was a dedicated public servant, who always put the interests of Tennessee and its citizens first. He was a generous, fair, and even-tempered mentor and friend to his law clerks and to everyone with whom he worked in the judicial system. But more than anything, he loved his family and kept them his number one priority. I am grateful for Justice Drowota's influence on my life. My condolences, thoughts, and prayers remain with Claire and all the Drowota family." "Justice Drowota was my life-long friend and mentor. It is not possible to overstate his influence on my life and career. It was on his advice that I ventured into a career in health care law after completing my clerkship with him. My father worked with his father on the board of the Disciples Divinity House at VU. He was proudly VU and I was equally proud UT and we had such great times. I fondly remember our surprise dinner with most of his clerks to celebrate his 25 years on the Court. A thank you letter from him is prominently displayed in my office. RIP my friend and deepest condolences to his family. "As a young lawyer with only 2 years of experience in 1988, I had the opportunity to argue my first case before the Tennessee Supreme Court. Justice Drowota knew I was a new attorney with an important issue to argue. I will always remember how, after a tough grilling by the other Justices, he stepped in and asked me a question that helped me get on track with my best argument. I will remember his kind demeanor and compassion for a young upstart lawyer. I always respected his legal skills and opinions. Sincerest condolences to his family." "Due to A. B. Neil, Jr.'s appointment as Supreme Court Clerk in 1987, (I was Mr. Neil's legal secretary and went with Mr. Neil to the Clerk's Office), I was privileged and blessed to have known Justice Drowota. He was a kind and caring person; approachable, a good example for everyone in the legal and judicial fields; passionate about his work; a gentle man who showed respect to everyone he encountered. A family man, a good friend to those who were privileged to be his friend. I know he has touched many lives as he has mine. He will be missed. God bless his family." "The Honorable Justice Frank F. Drowota....a most deserving title....I was truly blessed to have had a friendship with him....he impacted and enriched my life in so many ways....his footprint will be everlasting with the opinions he wrote and the many leadership roles he assumed for the betterment of his community.....he sweeps the table in Life Achievement Awards...."
"I met Justice Drowota when I was sworn in by Justice Birch in 2003. Since then I have had to pleasure of seeing and chatting with him over the years. He was friendly, cordial, kind and always made me feel like a friend. I will miss him and I want to send my condolences to the family. I will be out of town during his service but my thoughts will be with him. Rest In Peace my friend." "When Justice Drowota was sworn in as a new judge in 1970, his father’s advice to his son came, not surprisingly, from scripture. His father advised the new judge to "act justly, love mercy, and walk humbly with your God." (Micah 6:8) This came to describe not just how Justice Drowota approached his role as a judge, but it describes how he lived his life. Those of us who had the wonderful privilege of working with him know well that his contributions to the law and to the administration of justice are just part of his life story, for the man behind the robe was every bit as gracious and genuine and classy as what the public saw. God bless you my friend and mentor." "Praying for the comfort of strength of the family. So sorry to hear of the passing of Justice Drowota." "Frank Drowota was appointed to part II of the Chancery Court of Davidson County in the fall of 1970. By the time that I was appointed to Part I of Chancery in January of 1973, Frank had already made his mark as one of the best trial judges in Tennessee. His work ethic, his judicial temperament, his treatment of clerks and other staff members and his determination to keep up with a mountainous Chancery docket had been duly reported - back when two daily papers had reporters covering the Davidson County Courthouse. "Our service together lasted only until the summer of 1974 when Frank was appointed to the Court of Appeals. But, looking back, our days in Chancery seem like they happened only yesterday. Our dockets included election contests, disbarment cases (yes, before there was a BPR), those hellish appeals from the Public Service Commission, and jurisdiction over all appeals involving the state government. A lot of the cases were fraught with intense political questions. Frank, however, never flinched, and I learned from him that our job was simply to do the best we could. We both had young children and wives who understood that our weekends were frequently just two extra days devoted to our work. Frank and Claire became good friends, whose friendship we treasure to this day. The rest of the story is Frank's career on the Court of Appeals and, subsequently on the Supreme Court. He never shucked the habits he had as Chancellor of Part II of the Chancery Court of Davidson County. The State of Tennessee is a better place because he devoted his exemplary life to its service. Rose and I extend our sympathy to Claire and the family and our thanks for all they have meant to us." "Helen and family--you are in our thoughts and prayers." "One of my regrets was not knowing Judge Drowota earlier in my career. A favorite quotation from President Teddy Roosevelt that reminds me of Judge Drowota is: "Nobody cares how much you know until they know how much you care." The easier road for someone of his intellect and ability would be a passive one of position and privilege. Judge Drowota was just the opposite - engaged, challenging, compassionate, insightful and helpful. He was a stalwart in protecting the Judiciary; and he was a valued adviser during the process of proposing and adopting Amendment 2 to our Constitution, which answered a number of issues related to the selection of appellate judges. Tennessee, sadly, has lost a real leader, whom we all will miss for years to come." "No one enjoyed the respect, admiration, and affection of his colleagues like our dear friend and former Chief Justice, Frank Drowota. His high school classmates voted him Most Friendly and nothing changed throughout his career as a chancellor, a judge, and, finally, as a justice of our highest state court. His work ethic was legendary, but his kindness toward those new in the judiciary was his trademark. His smiling face, easy manner, and encouraging words are qualities rare in all walks of life, but especially so in our adversary system. I cannot think of a better role model for the young men and women of the bench and bar. And now, Frank is for the ages ... and we are left to mourn his passing. His remarkable family is his legacy." "Justice Drowota was a welcoming force when I joined the court in 1994. We laughed often about his unwillingness to offer me a job when I graduated law school and wondered what I could have become had he been willing to mentor me at an earlier point in my career. Formally and informally, he undertook the task of mentoring me later in life, graciously helping me to learn about the intricacies of the court. While I was his colleague, Justice Drowota always treated me with respect, despite my young age and naiveté, but what was more significant to me is that he treated me exactly the same after I ceased to be his colleague. I was not singled out for his kind treatment. Rather, Justice Drowota seemed to me to treat everyone he met with the same generosity of spirit and kindness of heart. While I was grateful for his egalitarianism, his wisdom, and his guidance, I also appreciated his ability to moderate tension with his good wit. He was able to enjoy—or produce—a good laugh, even at his own expense. I learned that when he got that sparkle in his eyes and that little grin on his face, you better watch out! I will remember Justice Frank Drowota for all that he did for the state of Tennessee, but even more so for who he was – a kind, fair, and wise man, who took time to help others. We owe a debt of gratitude to Claire and his entire family for sharing him with so many of us. Claire, my thoughts and prayers are with you." I had the privilege of serving as Justice Drowota's law clerk from August 1983 until August 1984. It was a wonderful year working with such an incredible man. All of the great things said about Justice Drowota on these pages are true. When I entered private practice, I modeled myself based upon his examples. His influence on my life continues to this day. May God bless Justice Drowota, his wife Claire and all of his family.